The Hotbox electrical sulphur burner is made out of stainless steel with an aluminum sulphur box. 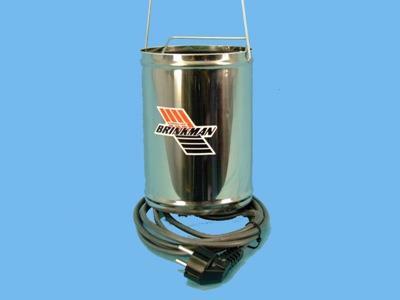 This sulphur burner with automatic temperature controller and 100 Watt capacity makes sure that the ideal temperature will be reached quickly. When the altered temperature is reached, it will be kept at the right temperature with a power usage of less than 50 Watt. At this ideal temperature the evaporation of sulphur will be optimal and burning will not be possible. This will save a big amount on the power usage. The Hotbox sulphur burner is equiped with 5 mtr. cable and electric plug. With a more expense the Hotbox can also be equiped with an adjusted cable length. The Hotbox sulphur burner evaporates sulphur for 150 hours when it is filled to the marking. This way the Hotbox evaporates less than a gram per hour. We advise to hang 1 Hotbox per 100 m2.